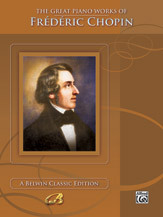 CHOPIN - Alfred Publishing Co., Inc. Publisher Desc. The featured pieces include such familiar titles as the Military Polonaise, the Raindrop Prelude, the Minute Waltz, the Revolutionary and Aeolian Harp Etudes, plus the famous Funeral March, along with many other often played pieces. 55 piano solos on 176 pages. This book features a painting of the composer on the cover, plus includes a preface about the composer and the wide selection of pieces included.